US 301 is a major north-south roadway used for travel through Pasco County. It is an important roadway in the Tampa Bay area regional transportation network, carrying regional traffic from west central Florida to other areas of the state and the nation. 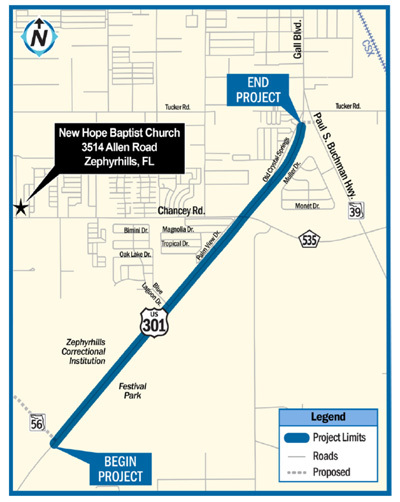 The study evaluated the social, cultural, economic and environmental effects associated with widening the section of US 301 from south of the proposed connection of SR 56 (on the south) to south of the proposed future realigned SR 39 intersection (on the north). As many as 12,500 vehicles per day currently travel this section of US 301 and it is important to consider how this corridor will continue to serve this region in the future. By the year 2040, traffic on US 301 will grow to an estimated 39,500 vehicles per day causing an unacceptable level of service on the existing two-lane roadway. US 301 is a designated emergency evacuation route, and maintaining acceptable operation conditions is vital to the safety and welfare of residents of Pasco County. US 301 is identified as a regional roadway by the West Central Florida Metropolitan Planning Organizations’ Chairs Coordinating Committee and is included in the Regional Roadway Network. It is a critical link in the local and regional transportation network, supporting a growing economy and the safe and efficient movement of freight and goods throughout the state. The currently adopted 2040 Long Range Transportation Plan for the Pasco County Metropolitan Planning Organization documents the need to widen US 301. A Public Hearing was held on September 22, 2015. Si usted tiene preguntas o commentarios o si simplemente desea mas informacion sobre este proyecto, favor de ponerse en contacto con la señora Lilliam Escalera, al teléfono 813-975-6445 o correo electrónico lilliam.escalera@dot.state.fl.us.